Ready for more goodies tomorrow! This entry was posted in Dinner on August 19, 2011 by andrewsbeth. 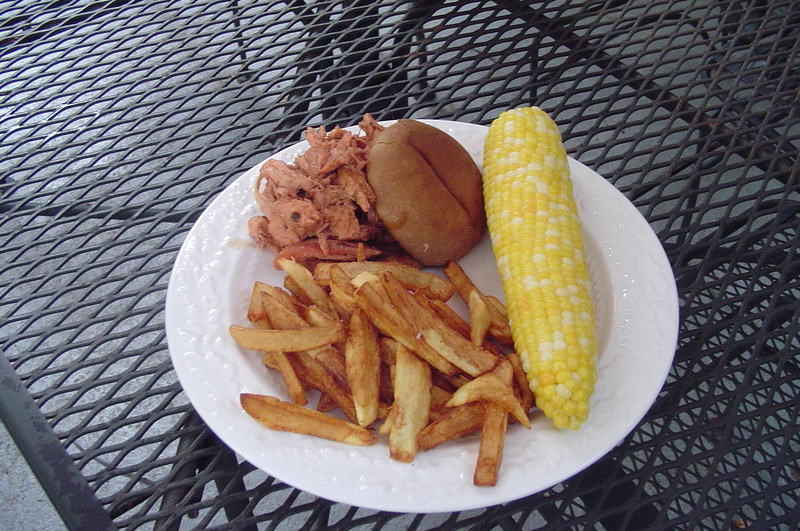 We had corn on the cob tonight too (Szaly’s, because that’s what Giant Eagle had). It was such a beautiful evening to eat outside and enjoy the late summer weather. By the way, when Jeff saw this post the first thing he said was “Beth made pasta. It looks good. You should make it too sometime!” Unfortunately, I’ll miss everyone at the market because I have to teach a class tomorrow, so if there are any secret ingredients be sure to let Jeff know! Does Jeff eat tuna fish? It is an old school recipe. Sauteed onions, canned mushroom soup, milk, chedder cheese, 2 cans tuna, black pepper and a little mayo. I did use whole wheat penne pasta. If that redeems me at all. Usually I put celery and peas in it, but didn’t have any. Sometimes, I just want a casserole, and there is always leftovers! Sorry you will not be at the market tomorrow Tom. Wonder what treasures Jeff will bring home! The fact that we’re craving casseroles is just one more sign of fall, don’t you think? I do love comfort food like that, though, and make something quite similar from time to time. I use chicken more often than tuna, but it might be a nice change of pace. It looks fantastic! I do like Tuna. I brought home potato and cheddar perogies (sp?) today – yay! BTW – the potato and cheddar perogies – wow – so good! What a great lunch. I didn’t see the perogis place. That sounds like a good combo! It was Down at the end….Kim told me about it :). 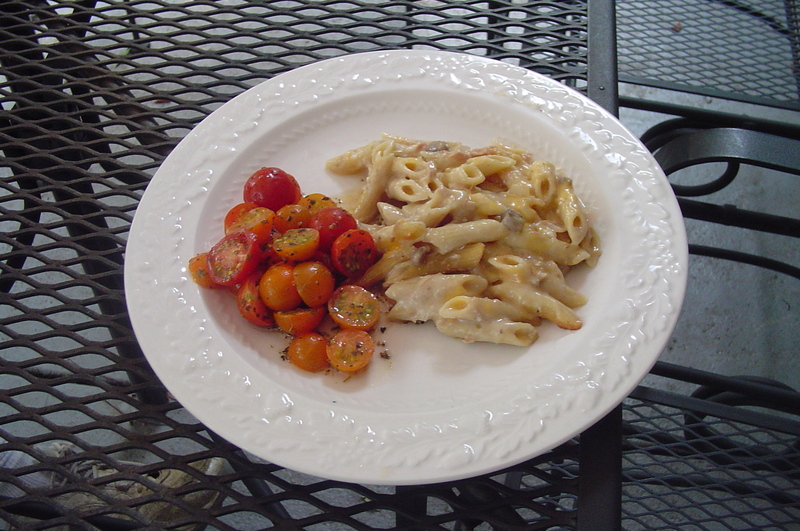 I am so happy that you posted a different way to use up all of those cherry tomatoes! 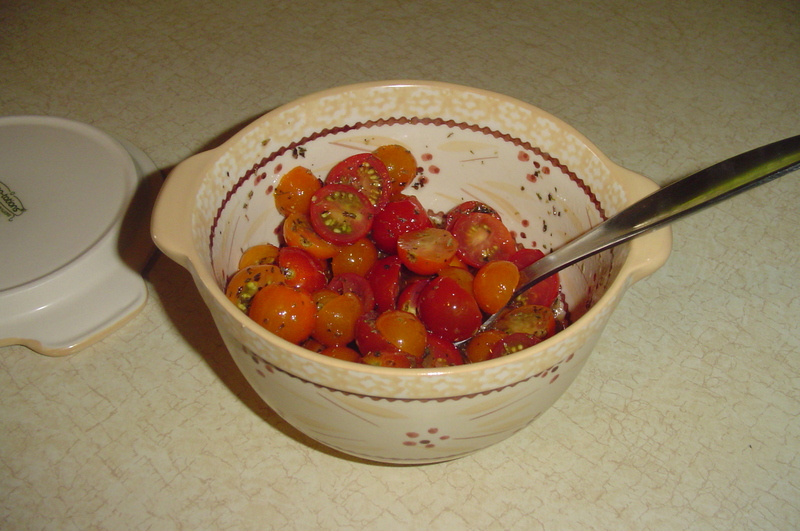 Kim planted some in pots at our house too, so we have been eating them on salads every day and roasting them by cutting them in half, drizzling with olive oil, salt and pepper, but I needed a new recipe!!!!!!!!! Dearest Bethy, Thanks so much for feeding the grands so much too. You are the best! Kim and I are just lucky to be feeding ourselves right now- soon I will get in the groove! Jeff- Thank goodness for pierogies! Care, Thank you , but you know I love feeding those little grand faces! You’ll get into a routine before you know it. And don’t worry, there are always the “Hey Hon, %%&#$*$## &@@” phone calls to look forward too! I am not sure how you would have missed them. It was just a huge stall where the sign said perogies and they were cooking them so it was hard to miss the smell of frying onions and dough. We got ours, Jeff got his, I must have missed you. Sorry! That’s alright , just kidding, there is always next week!